Cuisine: Czech/Slovak by way of Mid-America. Mon-Fri 7am-2pm, Sat 8am-3pm. Closed on Sundays. 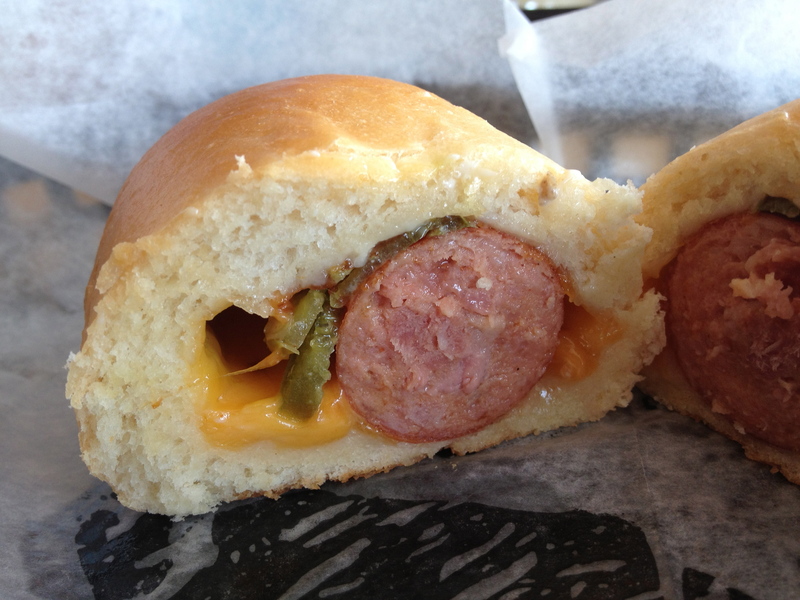 So, kolaches. Texans assert that they’re a Texas thing. Minnesotans may claim that they’re spelled ‘kolacky’, and have dubbed Montgomery, Minnesota the ‘kolacky capital of the world’. Iowans… well, they make claims, too… yeah, thanks for the input, Iowa. Czechs and Slovaks undoubtedly find this Yankee bluster cute, and as best as anyone can tell, are the actual originators of the pastry. About the only thing anyone could reasonably agree upon is that Columbus has no claim to involvement with this promiscuous pastry, or at least, that is, up to now. Kolaches are apparently the kind of thing people get homesick for, so with Columbus’s significant transplant population, it was only a matter of time before someone arrived with the fix. 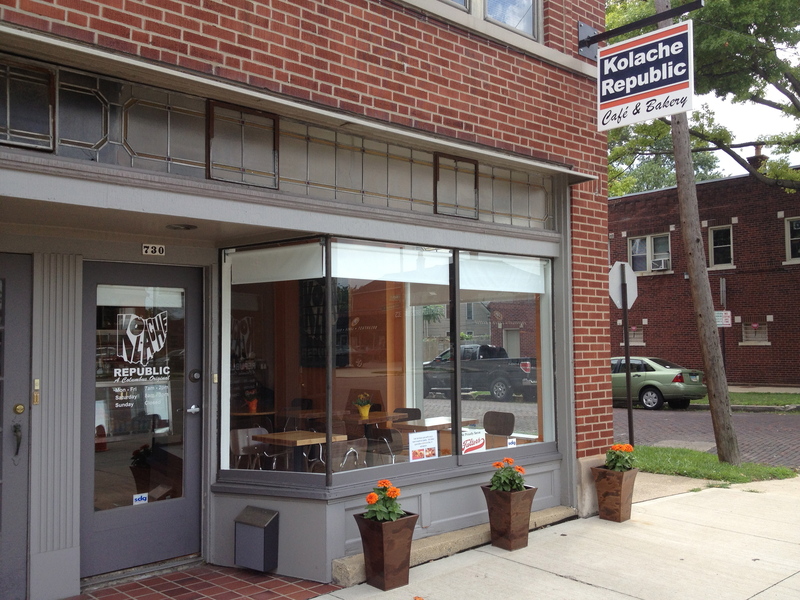 Enter Kolache Republic, a tidy new little cafe on South High in the Brewery District. 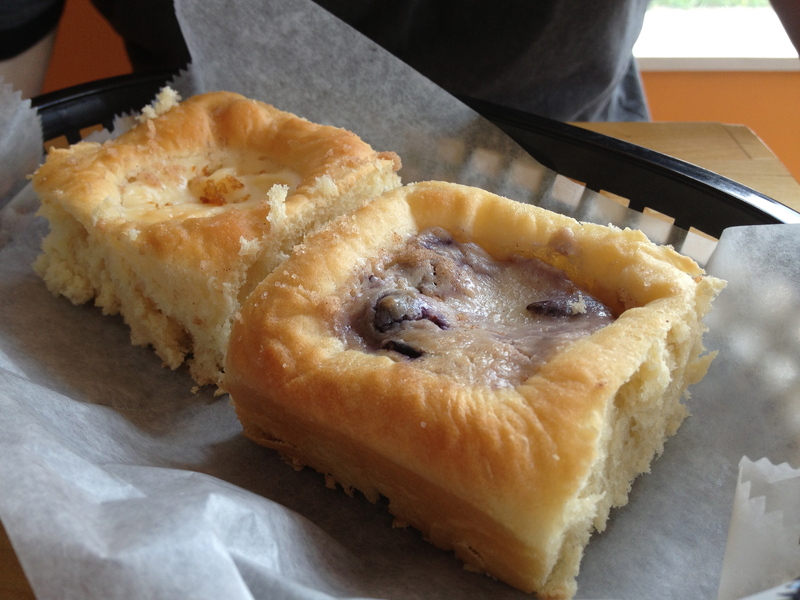 For the uninitiated, kolaches come in two basic forms (and people with too much time on their hands even bicker about this, but never mind) – square sweets, and elongated savories. Both begin with a light, pillowy, white flour pastry. The sweets are topped, somewhat like a danish, with any of a variety of fillings, with the blueberry and lemon curd being among our favorites. The savories are filled with a delicious kielbasa or ‘hot hot hot polish’, come in 3 flavors, and take a form not unlike a pig in a blanket. We’ve enjoyed both varieties, both here and at the food cart of the same name that came before. They’re absolutely destination worthy, especially when paired with some of their Cafe Brioso based coffee drinks. 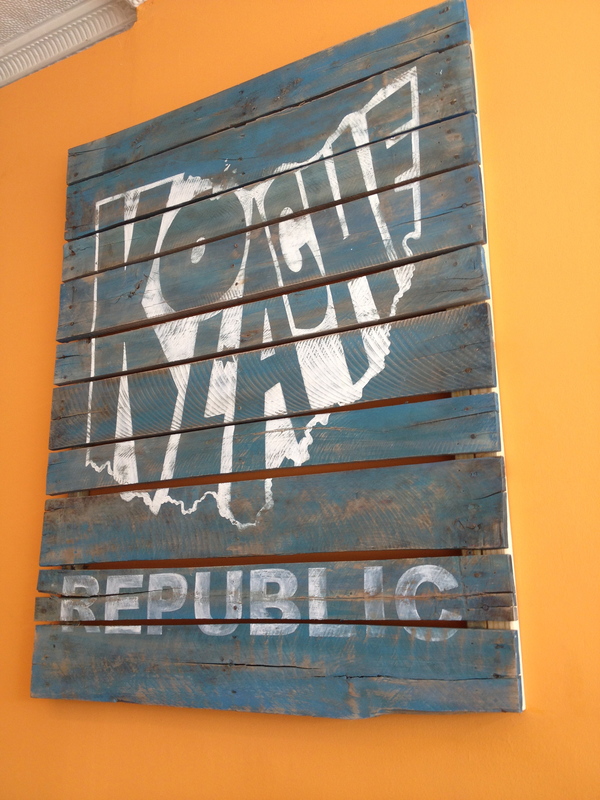 But Kolache Republic has something we like even more. Something that’s served as a special, that we wish were always available. Something that’s not a kolache. That item is the runza. Nebraska claims this dish, though the Germans deserve the credit. Yep, another one of those things. It’s a larger bun, something along the lines of 6″ in diameter, perhaps made with the same dough as the kolaches, filled with seasoned sauerkraut and ground beef. That may not scan like something that’d generate excitement, but I’d encourage you to give it a go. My wife thought it sounded unpleasant, but upon seeing mine begged for a bite and thereafter pronounced it delicious. 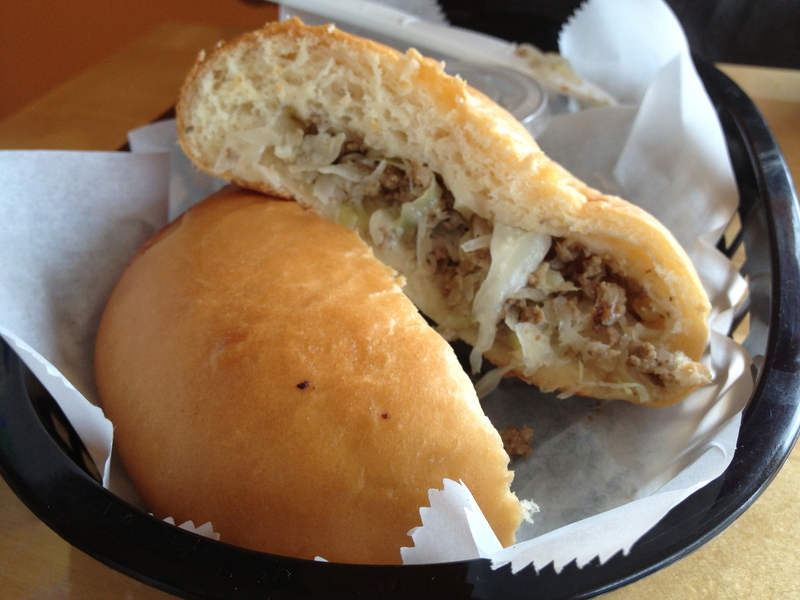 Solid sides and a sandwich are also available, making Kolache Republic an ideal lunch stop. Do check ’em out!